In 2017, the state reached its highest summer temperature since recordkeeping began, according to data from the National Oceanic and Atmospheric Administration. The finding tracks with the planet’s accelerated warming trend, a result of fossil fuel emissions and other human activities. “It’s the same type of pattern we are seeing everywhere,” said Daniel McEvoy, who studies weather patterns at the Desert Research Institute’s Western Regional Climate Center in Reno. 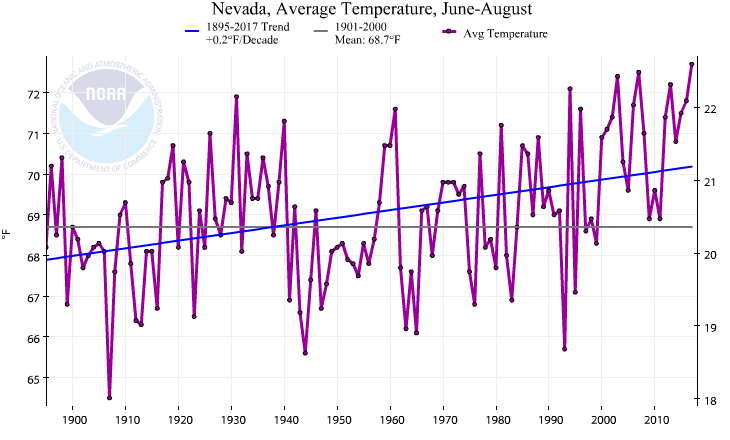 Although the trend line suggests an average temperature increase of about 0.2 degrees per decade, there is considerable variation in year-to-year summer temperatures. Why? That’s the weather. Weather describes the short-term behavior of the atmosphere. It is driven by decadal and even shorter cycles. These include the El Niño and La Niña oscillations, which are driven by changes in oceanic temperature. Such cycles account for the natural spikes and drops. Climate is more predictable because it describes the long-term trend. Where weather is discussed in hours and days, climate is viewed in 30-year increments or centuries. It shows the long-term behavior of the atmosphere, a region’s average weather pattern. So, will every summer be warmer? In all but one city, the 2017 summer was the hottest in the instrumental record. 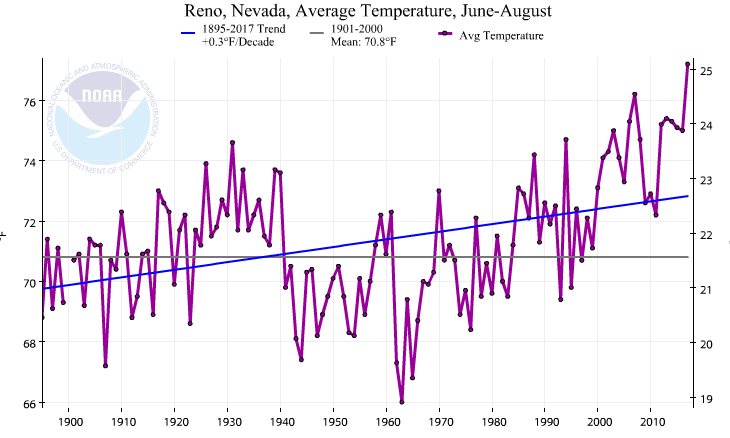 Carson City, Ely, Las Vegas and Reno all recorded their warmest average temperatures from June to August. The only city that departed from the overall trend was Elko, which listed a record warm summer in 2013, when it’s average temperature was 71.7 degrees (this summer was close at 71.6 degrees). 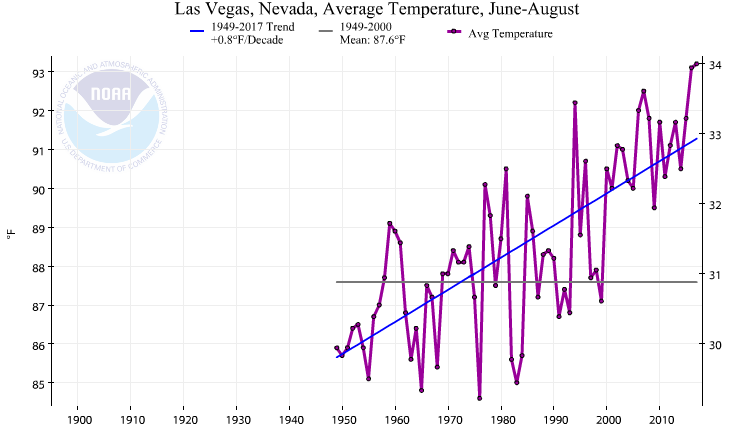 The trend was most extreme in Las Vegas, where average summer temperatures are increasing at a rate of nearly one degree (0.8 degrees Fahrenheit) per decade. 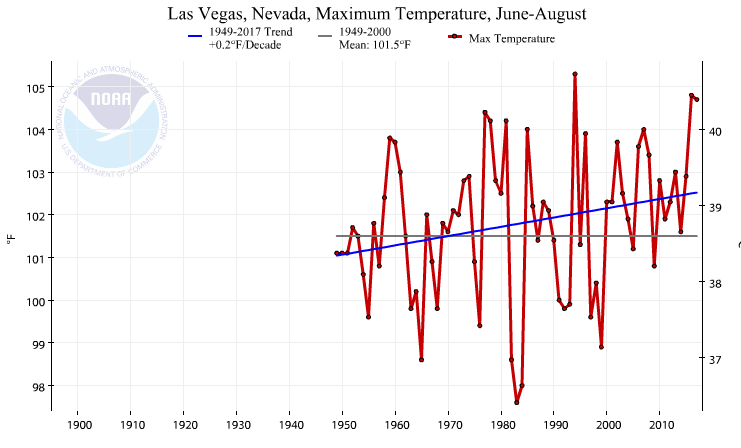 To give a snapshot of what this looks like: In 1949, the average summer temperature for the Las Vegas region was 85.9 degrees. This year it was 93.2 degrees. The NOAA data shows that minimum summer temperatures are generally rising faster than maximum summer temperatures. 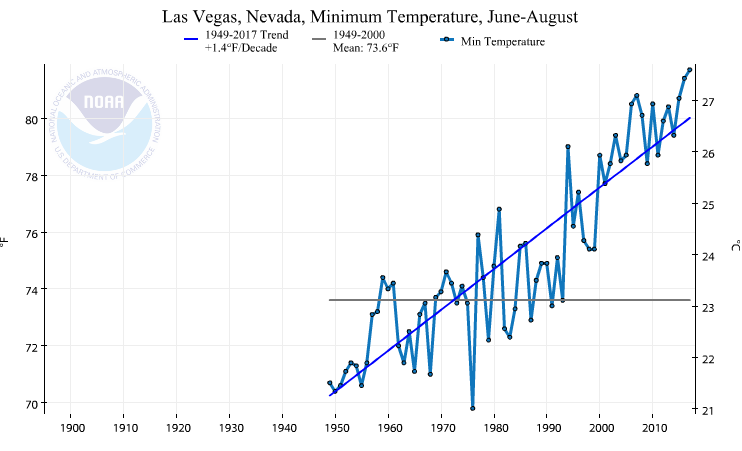 This means that nights are getting warmer faster than days, McEvoy said, a trend that is playing out not just in Nevada but also throughout the United States. “It’s not cooling down as much,” he said. The result is a trickle-down effect, said Nick Obradovich, a researcher at the MIT Media Lab who has studied the effect of climate change on sleep. In a study published earlier this year, he and other researchers found a connection between higher nighttime temperatures and disruptions in sleep. Over time, average temperatures are expected to keep going up, and weather is expected to become more extreme, increasing the intensity of heat waves, precipitation and droughts. “Climate models are predicting more extremes in the future,” McEvoy said. 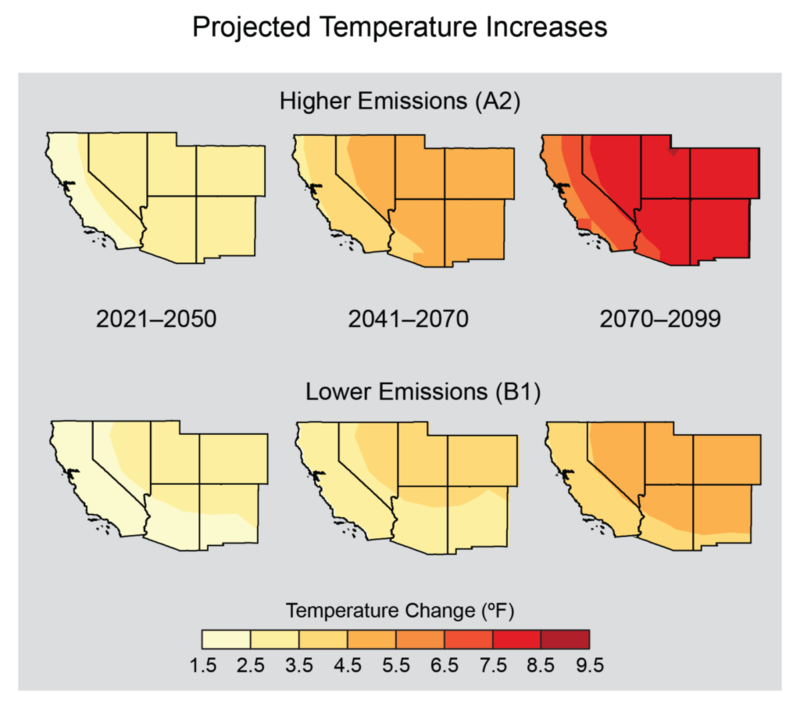 According to the government’s National Climate Assessment, unless global emissions are reduced, temperatures in the Southwest are expected to rise as much as 5.5 degrees by 2070, perhaps even earlier. This could reduce water supplies and hurt the economy, especially in tourism and agriculture, according to the report, which was compiled in 2014 by leading researchers at institutions including UNLV, NOAA and the National Park Service. Geoffrey Heal, who studies environmental economics at Columbia Business School, said policymakers face a balancing act. They must weigh the costs of reducing carbon emissions against the benefits of avoiding the effects of climate change on things like labor productivity and agricultural productivity.